The Red-throated Diver is the smallest of the UK's divers. Its grey-brown plumage and up-tilted bill readily distinguish it from the other species. In summer it has a distinctive red throat. Like other divers, it has been known to stay underwater for up to a minute and a half. With webbed feet at the end of powerful legs, it is a skilled underwater hunter, but with legs set well back on its body, it is very ungainly on land, only coming ashore to breed. A circumpolar breeder from the high Arctic south to the northern temperate zone, Scotland is at the extreme southern edge of its breeding range. Shetland is the Scottish stronghold with almost half the Scottish breeding population there. because even a short time off the nest means the eggs are vulnerable to crows and gulls. Their best breeding season in recent years was 2012 when the miserable wet summer reduced the number of walkers round these lochans. 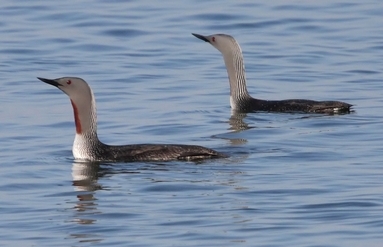 Although Red-throated Divers breed on the hill lochans, they feed on the sea and in winter are almost completely maritime. Round the coast of Arran they have been recorded in every month of the year. Back in their breeding areas by late March, clutches of almost invariably two eggs are laid from early May through to June, with birds fledging in early August. Adults attend to youngsters for some time after fledging and the late summer and autumn are good times to look out for family groups in our sheltered bays. Finally, an old name for this bird is Rain Goose For example, in Shetland this bird is considered one of the best weather indicators, short cries or flying inland indicated fine weather, long, plaintive ones or flying out to sea wet weather. Whether there is any truth in this or not, listen for their distinctive plaintive call as they fly to their feeding grounds in the sea.